Weissman & Dervishi is a South Florida law firm that offers businesses and individuals involved in complex civil litigation an alternative to large firms. We practice in state and federal courts and agencies, in both trial and appellate litigation, and in domestic and international arbitration. We move cases to conclusion efficiently and expeditiously through summary proceedings, bench trials, jury trials, appeals, execution of judgments, bankruptcy, and settlement negotiations at every stage of litigation. We have distinguished credentials from elite universities and law schools, and broad practical experience. The firm and its attorneys are Peer Review Rated AV Preeminent by Martindale-Hubbell, its highest rating for legal ability and professional ethics. 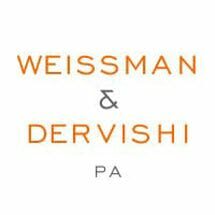 Weissman & Dervishi was founded more than twenty-five years ago, in January 1989. We have developed a culture of personal loyalty, team effort, and dedication to providing high-quality legal services. Our clients reap the benefits of that culture. The firm currently has four attorneys, three paralegals, and other support staff. The firm is organized to work as effectively as a litigation practice group in a large law firm. We are experienced in simultaneously handling several complex, document-intensive cases. We maintain long-term relationships with our clients and encourage them to become actively involved in every phase of the engagement. We take the initiative in communicating frequently and effectively with our clients, keeping them aware of every development in a case and consulting with them often. We strive to be flexible, responsive, and accommodating to our clients’ needs. These standards apply to everyone in our firm, from attorneys to receptionist.